The Missouri National Guard continues operations in southeast Missouri, now with 530 Service members spread over the affected areas, said task force commander, Col. Wendul G. Hagler, commander of the 70th Troop Command of Jefferson Barracks. Initially, 200 guardsmen were deployed at the Governor’s order on Monday. 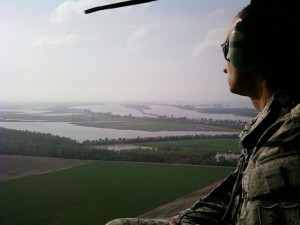 Task force commander Col. Wendul Hagler, commander of the 70th Troop Command, Jefferson Barracks, assesses flood conditions. The Guard is assisting local authorities by sandbagging, montoring levees, conducting route reconnaissance and door-to-door safety visits. Assisting law enforcment and first responers is also part of the mission. The Guard reports that on Tuesday afternoon, the 1221st Transportation Company headed to Neelyville in Butler County to check on the well-being of residents stranded in homes surrounded by murky brown waters. There they encountered resident Randy White who was attempting to reach stranded family members via boat. With assistance from the Missouri Guard, White’s son, daughter-in-law and grandchildren were brought out safely. Staff Sgt. Thomas Stebbin, of St. Louis, the convoy commander, said the company is deploying 44 soldiers, whose mission will be to deploy portable bridges in flood zones, providing access for civilian and military traffic. Deploying the bridge sections in flood waters will present a different set of challenges than deploying them as a river crossing because the flood waters could be traveling at faster speeds, said Stebbin. Pulaski County also became a support mission where Guardsmen were also called to assist local authorities with pulling vehicles from flood waters. Units supporting the flood response include: 70th Troop Command, Jefferson Barracks; Headquarters and Headquarters Company, 35th Engineer Brigade, Fort Leonard Wood; 175th Military Police Battalion, of Columbia; the 1140th Engineer Battalion, Cape Girardeau; the 1221st Transportation Company, of Dexter, Portageville and Sikeston; the 1140th Headquarters and Headquarters Company, Cape Girardeau; the 1138th Military Police Company, of West Plains and Springfield; the 1138th Engineer Company, of Farmington and Fredericktown; the 1175th Military Police Company, of St. Clair and St. Louis; the 880th Engineer Detachment, Perryville; the 220th Engineer Company, Festus; the 1438th Engineer Company, of Macon and Kirksville; 70th Mobile Public Affairs Detachment of Jefferson City; and the Joint Operations Center at Joint Force Headquarters in Jefferson City. Missouri’s Soldiers and Airmen will continue working in support of local authorities until released by the governor. View more flood and operations photos on Facebook.